6 week, 6 month Follow-Up! I have been so lax in providing an update but luckily I have much to report! Last Monday I had my physical therapy evaluation at HSS + six-week follow-up for my SDD surgery / six-month follow-up for my PAO surgery. As an aside, I have decided to do my physical therapy at HSS because I will be rehabbing both legs and want to be assured that I am in the best hands. The evaluation went alright (testing how far I can rotate my leg; can I pull or push against weight) although I was unable to balance all my weight on my left operated leg and had some pretty striking pains when I tried to do some of the exercises. Unfortunately, I am a bit weaker then they’d expect at this point in the recovery; however, that might be related to the pain and tightness issues I’m having around my greater trochanter in my left hip. The therapist advised me to not go beyond my pain tolerance when doing my exercises and suggested that I could use only one crutch starting this week. I have a full session with physical therapy for the first time tomorrow and I’m curious as to what they will have me doing. I will be rehabbing both hips since I had to stop PT on my right hip in early April due to the psoas flare-up. My hips! On the left side (my right hip) are the 5 screws from my PAO in December and in my right side (my left leg) are the 3 new screws in the greater trochanter from my SDD surgery. 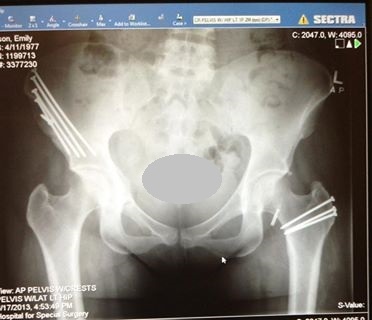 My doctor then had a couple of X-rays taken to see if the broken trochanter was healed. I met with Dr Sink who confirmed that yes, the bone was fully healed (hooray!) and that I was cleared for full weight bearing / to move to no crutches. At my next appointment, in about 6 weeks and after I’ve been in PT for a bit, we’ll have a better idea of how my recovery is going. I felt really freaked after the appointment. It took me a day to realized that the reason I was shaken a bit was that, for the first time in a long time, I don’t have another surgery to plan for. It’s not to say that another surgery is impossible or even unlikely, just that one’s not on the horizon. It’s been a while since I could say that! This past week I’ve been using either two or one crutches when out, and no crutches while at home. Without crutches, I walk with a pronounced limp, which is why they prefer I at least use one crutch. I literally can’t not limp when I walk. I assume (hope?) it will go away as I get stronger. I’ve really been feeling quite good to the point where I decided on Friday that I was sick and tired of looking out the window as the day passed by and instead took the Access-a-Ride bus to the city and to work. It was GREAT to see everyone, and to get dressed and out of the house. I’m hoping to make it in two days a week (working at home the rest of the time). 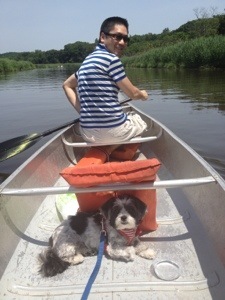 In other news, my husband, dog Boris and went canoeing on Long Island yesterday and it was FANTASTIC to do something (moderately) physical that didn’t require me to use my legs. The weather was great and we capped the day off with super tasty Latin American seafood in Brooklyn. 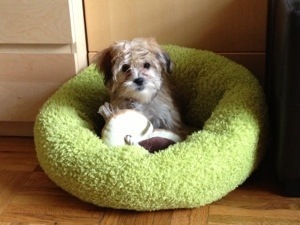 Today was brunch, puppy visits from Boris’ new pal Holly, house tidying and rest. It’s been a long time since I felt somewhat normal and this weekend I remembered what it was like to feel like me again. I am cautiously optimistic that I could someday be better(ish), hip wise, and that sounds like lovely music to me. This entry was posted in Uncategorized on June 23, 2013 by dramaticallyhip.